Our subscribers made +14.6% profit in December. We did not trade on Tuesday and Wednesday and concluded this month with +444 pips of profit, which equaled to +14.6% in our Trade Copier Master Trading Account. We got stopped out of the CADJPY trade at 103.68 for a small loss of -12 pips. The USDJPY was closed manually with +3 pips profit. Therefore the total trading result today is a small loss of -9 pips. We did not trade during Christmas holidays. Therefore the total result for this week is +86 pips. Our CADJPY trade reached the first profit target. We used trailing stop orders to close the remaining two units. The 2nd unit was closed at 103.79 and the 3rd unit was closed at 103.87. 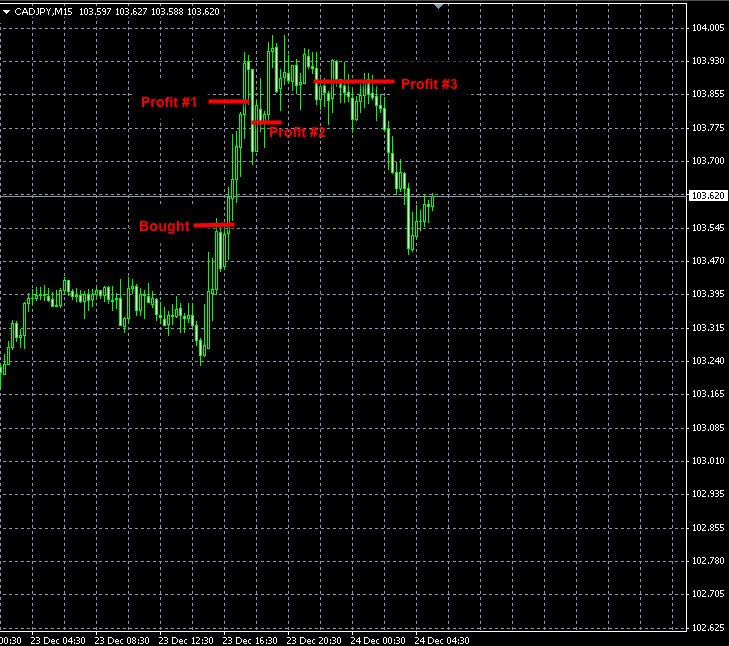 The total profit for this Forex signal is +86 pips. Today’s Forex signals were cancelled due to the lack of action. Our Forex signals issued on Thursday and Friday were not triggered. Therefore we close this week with +93 pips of profit made on Monday and Tuesday. There are no signals this morning as the markets are waiting for the FOMC news. The EURAUD trade today was closed with +67 pips of profit.